The Slades fastball club was established in 1998. The players past and present of the Slades team would like to thank Neil and Brenda and their family for their fifteen years of appreciated support. The Slades team found ourselves in unfamiliar territory early this season. Losing the finals last year then our first game against the Pirates had the buzzards and jackals circling. Winning the territorials was a step forward in redemption, but as we learned last year; you are only as good as your last game. “There’s a couple of potential all-stars here.” Lou Brown saw the positive lining. Leaving the squad this year was Dave Colbourne. We wish him the best as he returns to his beloved St. John’s. His replacement Mike C. Reddy has some big shoes to fill and so far this year has proven to be a stealth weapon at second base. “Two hands, Hayes.” Once again Lou Brown makes a case for the fundamentals. Outfielder Joe Borkovic has struggled at the plate but his defense has been stellar. Better things will come this second half. “Of course if the umps are watching me real close I’ll rub a little jalepeno up my nose, get it runnin’ and if I need to load up the ball I just…wipe my nose.” This lecture from veteran Eddie Harris to ‘Wild Thing” Rick Vaughan could easily be Greg Skauge speaking to the young babe in the woods Mitch Madsen. A good luck charm the past few seasons, Skauge won’t be around to sling greaseballs in the playoffs, a potential title killer. 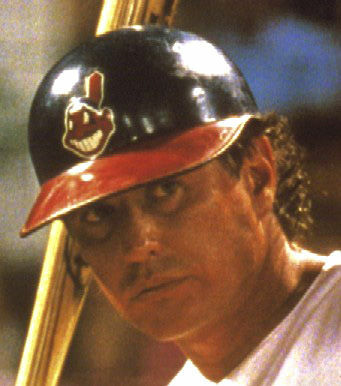 “Forget about the curveball Ricky, give him the heater.” Direction from Lou Brown to the Wild Thing and relevant advice to Mitchell “Town flirt” Madsen. Keep your head in the game. “Heywood leads the league in most offensive categories including nose hair. When this guy sneezes he looks like a party favour.” Harry Doyle’s description could apply to Mike Desjarlais who started the season hotter than a three balled tomcat. Eddie Harris: “Yo bartender, Jobu needs a refill.” Messing with streaks is a no-no. Devin Theriault is one of the streakiest hitters in the league. He is just now revving up so he will be considered the invisible man on the bench until he cools off. “It was out of my reach, what do you want me to do dive for it?” Roger Dorn non-chalantly makes an excuse to Jake Taylor about his intentions of laying it on the line. Kevin Vallillee has become a heart and soul member of the team by being the exact opposite of Roger Dorn. Damien Healy has become the man of many hats for Slades providing defense and situational hitting while being a solid teammate. With a gun to his head he makes some interesting life decisions. “Is very bad to steal Jobu’s rum. Is very bad.” After mimicking Reggie Jackson in the ’77 Series, Ryan Heslep will be pitched to with a lot more caution the rest of the way. “In case you haven’t noticed, and judging by the attendance you haven’t, the Indians have managed to win a few here and there and are threatening to climb out of the cellar.” Harry Doyle’s call proved the Cleveland faithful had a glimmer of hope in winning the pennant. The territorial playdowns proved that pitching and defense matter. Andy Stewart led the resurrection with an old-school exhibit of how to play hitters and trust your pitcher. “This guy threw at his own son in a father-son game.” Once again Bob Uecker as the Jack Daniels drinking Harry Doyle provides one more classic. Mark Whitehead has been playing an edgier game and his stats are proof. Playing the role of Jake Taylor: Matthew Simms.